The Native Nations Institute for Leadership, Management and Policy (NNI) at The University of Arizona has unveiled a ground-breaking new television/radio series called Native Nation Building. This series is designed to provide critical information to the leaders of Indian nations, students in tribal colleges and other educational institutions, and other interested individuals about what’s working and what’s not among Native nations as they engage in the difficult and daunting challenge of nation building. Native Nation Building, now available for purchase in audio (CD) or video (DVD) format, is a series of thematic interviews (each 30 minutes long) that presents the growing number of nation-building success stories and examines the roots of that success. Introduction to Nation Building chronicles the ongoing research of NNI as well as the Harvard Project on American Indian Economic Development. It articulates the five keys to successful community and economic development for Native nations—sovereignty (genuine self-rule), effective institutions of self-governance, cultural match, strategic orientation, and leadership. Constitutions and Constitutional Reform explores the evidence that strong Native nations require strong foundations, which necessarily require the development of effective, internally created constitutions. It examines the impacts a constitution has on the people it represents, successful reform processes among Native nations, and common features of constitutional reform efforts. Why the Rule of Law and Tribal Justice Systems Matter discusses the importance of having sound rules of law and justice systems and examines their implications for effective governance and sustainable economic development. It focuses on these issues and their role in the creation of a productive environment that encourages investment of all types from Native and non-Native citizens. Building and Sustaining Tribal Enterprises explores corporate governance among Native nations, in particular the added challenge they face in turning a profit as well as governing effectively. It focuses on how tribes establish a regulatory and oversight environment that allows nation enterprises to flourish, particularly the separation of day-to-day business operations from politics. Promoting Tribal Citizen Entrepreneurs examines the pivotal role that citizen entrepreneurs can play in a Native nation’s overarching effort to achieve sustainable community and economic development. It looks at the many different ways that Native nation governments actively and passively hinder citizen entrepreneurship, and the innovative approaches some Native nations are taking. A Capable Bureaucracy: The Key to Good Government explains that good governance requires effective, transparent and accountable bureaucracies. It demonstrates how clearly defined organizational structures and roles and responsibilities help make things work and get things done, and how their absence actively hinders Native nation governance and development efforts. Tribal Service Delivery: Meeting Citizens’ Needs discusses the issue of Native nations’ administration of service delivery in Native communities. It examines the unproductive ways services and programs have been administered in many Native communities in the past and the innovative mechanisms and approaches some Native nations are developing to maximize limited financial and human resources. Intergovernmental and Intertribal Relations focuses on Native nations’ efforts to enhance their relationships with other governments as a way to advance their nation-building objectives. It details how some Native nations are forging mutually beneficial intergovernmental agreements, and chronicles the many advantages to forging similar intertribal arrangements. Strategy and Leadership: The Path to Self-Determination ties together the themes discussed in the previous Segments into a discussion of how Native nations and their leaders move themselves and their peoples towards nation building. It seeks to answer the question all Native nations have: How do we get where we want to go? Moving Toward Nation Building contrasts the two approaches to indigenous governance — the standard approach and the nation-building approach — and discusses how a growing number of Native nations are moving towards nation building. 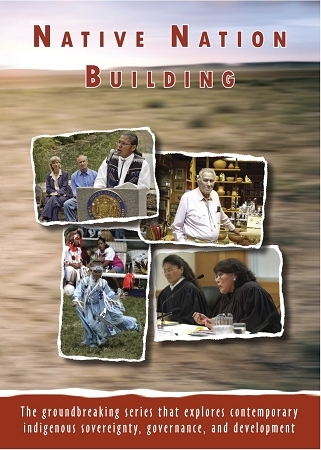 It provides specific examples of how the keys to nation-building bring wide-ranging benefits to Native communities. Interview guests appearing in the series include: Lance Morgan (Winnebago), CEO, Ho-Chunk, Inc.; Robert G. Yazzie (Navajo), Former Chief Justice, Navajo Nation Supreme Court; Elsie Meeks (Oglala Lakota), Executive Director, First Nations Oweesta Corporation; Urban Giff (Gila River), Community Manager, Gila River Indian Community; Dr. Manley Begay, Jr. (Navajo), Director, Native Nations Institute, The University of Arizona; Dr. Stephen Cornell, Director, Udall Center for Studies in Public Policy, The University of Arizona; and Dr. Joseph P. Kalt, Director, Harvard Project on American Indian Economic Development, Harvard University. Mary Kim Titla (San Carlos Apache), television news reporter with KPNX in Phoenix, Arizona and author/tribal radio talk show host Mark St. Pierre from Pine Ridge, South Dakota serve as co-hosts of the series. Jointly produced by NNI and KUAT MultiMedia at the University of Arizona, the program is being distributed to elected officials and staff of Native nations, students at tribal colleges and universities, and interested professionals working in and with Native communities throughout the U.S. and Canada. It also is being broadcast in markets with significant numbers of Native viewers. Through this widespread dissemination of Native Nation Building, NNI hopes to get the practical lessons it has learned in the hands of the people that need it the most.